The Miniature Apocalypse: Now what do i do with this bad boy? A place where you may learn stuff (or not). 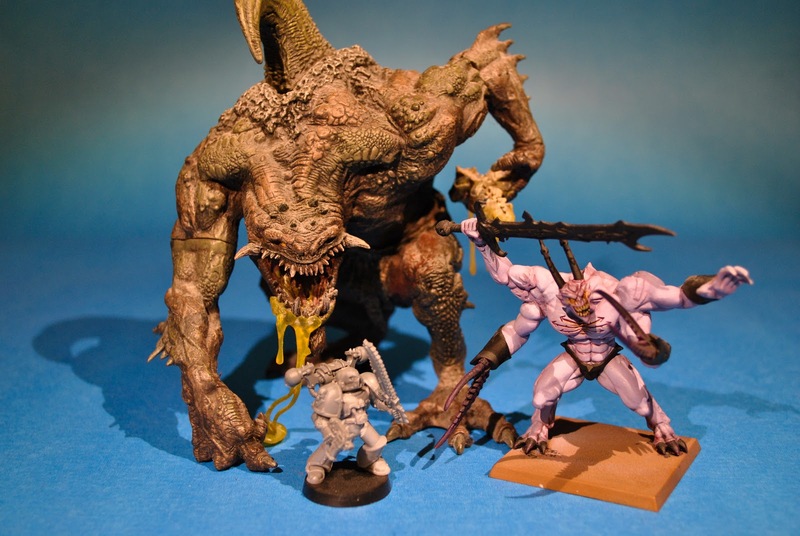 Miniature Apocalypse is all about helping modelers get their figures built with a modicum of quality, on budget and on the table. Remember the game store wants your hard earned money, but they should deserve it before you hand it to them. Now what do i do with this bad boy? So here i am in the middle of two other projects when who should come into my collection....Now the big question is Balrog wings and make it a Blood Thirster lord or go for a Nurgle conversion? So much to do, so little time. The figures are for size comparison. Given the pose, stance and face I'd say you need to go for an uber-thirster. I can see Nurgle working, but he's too muscular to look quite right - Nurgle is usually associated with fatties. Now the second question, tiny wings or giant balrog ones? For the last 30 years I've been building and painting models (15 yrs. competitively). I no longer compete but I continue to judge IPMS and other events. lately I've been building and painting war game armies and terrain. This also happens to be where I started the modeling hobby (Full Circle). As i look around the Net, i find very little Simple advise and technique. So i decided to try and fill the gaps. X-wing - Millennium Falcon Redesign. With all the talk about Chaos Marines, I decided to post up some photos of my Chaos Marine Biker project. The Miniature Apocalypse, Rhasputine © Copyright 2012. Awesome Inc. theme. Powered by Blogger.